This is quite a lengthy report of our recent NDM alumni reunion but to give you a short summary will not allow you to know the joy and excitement that we experienced during the 3 summer days when we gathered in Atlantic City. Read this only when you can spare the next few minutes to savor the wonderful time we had with fellow Notre Dameans. 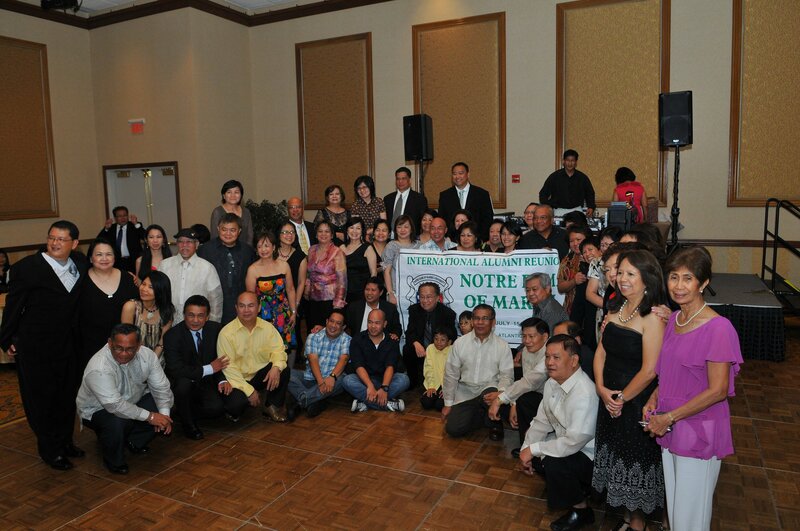 The 2nd Notre Dame of Marbel International Alumni Association Reunion held in Atlantic City, NJ was a blast. The 3-day affair started with a Meet and Greet at the 6th floor rotunda of Ballys Hotel & Casino at 5:00 p.m. on July 15, 2011, Friday. The hors d’oeurves of assorted cheese, crackers, bread, fruits and veggies were spread out and the bartender was ready to serve. We have prepared the souvenir bags filled with goodies. My ever-efficient classmate, Alicia Silauso-Cimene from Reseda CA, and I eagerly positioned ourselves at the registration table. My husband, Tino, put up our NDMIAA banner where everyone would notice it. But where were the alumni? The 3 of us, the bartender, and the waitress looked at each other every few seconds. As I sip my cocktail drink, I was getting a little antsy. Were we going to waste all these food? Will we keep ordering drinks and get ourselves drunk just so the bartender will not be bored? Anyone coming? Finally, the Notre Dameans did – past 5:30 p.m. First to arrive was Loreto (Toto) Yap from Toms River, NJ carrying in his arms a box containing our souvenir programs. One by one, two by two, in groups, the alumni trickled in; at first with a little bit of trepidation. But once they saw a familiar face, they smiled followed by a loud exclamation and warm hugs. “Hoy!” “Aaay! abaw!…” “Kumusta na?”…. ” Dugay na guid wala ta nagkitaay, no?… Maayo nag-attend ka” “…Ambot na lang, a.” The room filled with excitement and laughter. More than 70 came to register. After 40 years, I saw my batchmate, Eddie Reyes, and his lovely wife, Nenita Madria-Reyes (HS 71) who now live in Troy, MI, Marian Hilomen-Robinson (HS 71, Corinth, TX) looking much like she did in high school, Rebecca Himan-Titus (HS 72, San Jose, CA), Rebecca Dela Flor-Evangelista (HS 72, Norwalk,CA), the Yap siblings: Anna Yap-Pastor (HS 64, Corona,NY), Teodulo (HS 68, Reno Park, NY), Ric Yap (HS 71- Gen San City); Zeny Evangelista-Claudio (HS 69- New Milford, NJ ) with husband, Dr. Luis Claudio, among others. 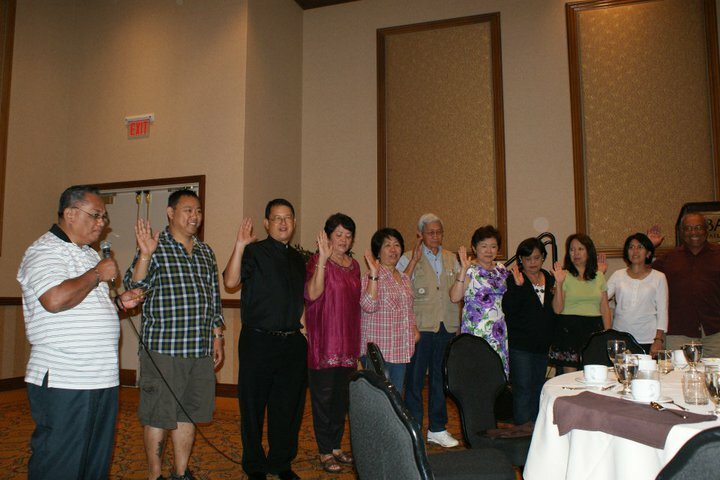 The Sandig siblings – Erlinda (HS 67), Angel (HS 70), Gloria (HS 72) Emy (HS 82), all from central New Jersey, were present with their spouses (Ed Visca, Bert Mabilangan, Adonis Crispo) and relatives- Bal (HS 62) and Mila Trespeces (NDMC 66, Jersey City), Dr. Luis Reyes (HS 60) and wife Josie from Ft. Washington, MD. 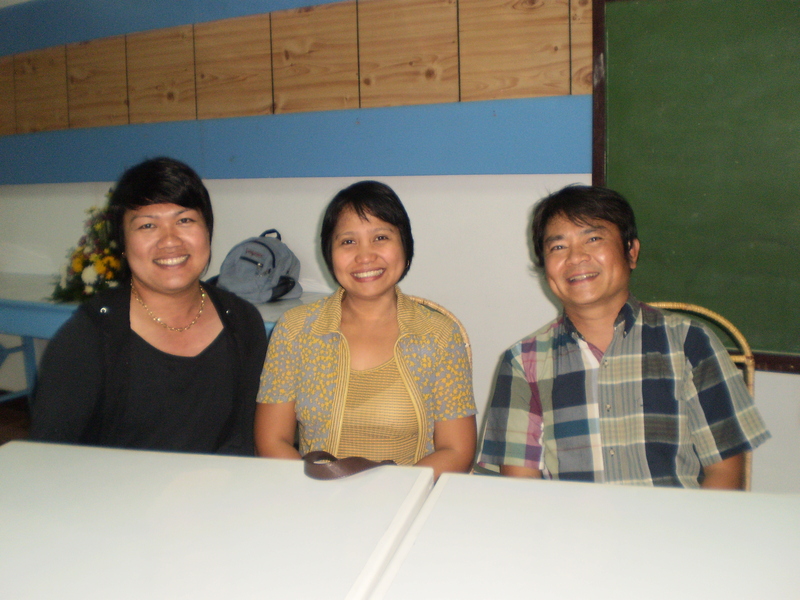 They were joined by Dr. Ben Lamorena (HS 63, Chicago, IL). 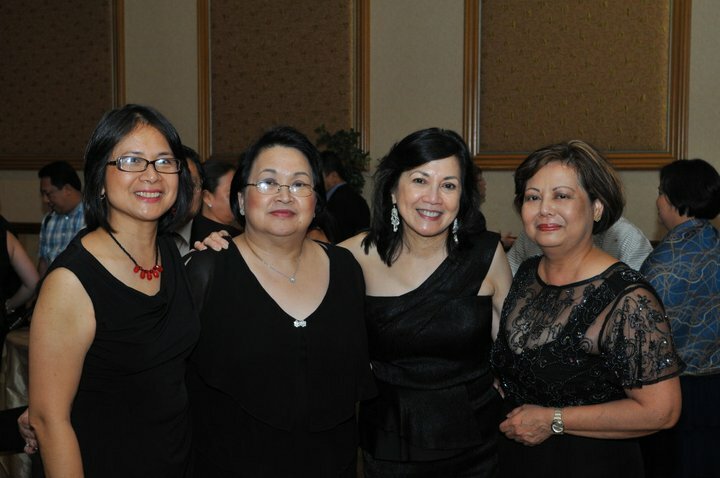 The lovely Soriano sisters- Gladys Dionisio (HS 71), Dinah Abad (HS 72), Azela Gozar (HS 76) all from the New Jersey shore area, walked in with Oscar Bugante (HS 72, West Covina, CA),and Reynaldo (Bebot) Bugante (HS 67, Sterling Hts, MI). Sally Ong (HS 67) and husband, Noli Liangco, arrived from Toms River, NJ with Tootsie Dela Cruz (OLPH 70, Florida). Dr. Diosdado Non (HS 54) and wife, Chris, drove from Jackson, NJ with his batchmate, Nang Lucring Aguirre who flew in from Tennessee. My beautiful classmate, Redempta Dela Flor, from Chino Hills, CA looked radiant with husband, Mark Dela, by her side. Straight from California and Atlantic City International Airport, President Don Donaire (NDMC 85) with his entourage -wife Eva, Fr. 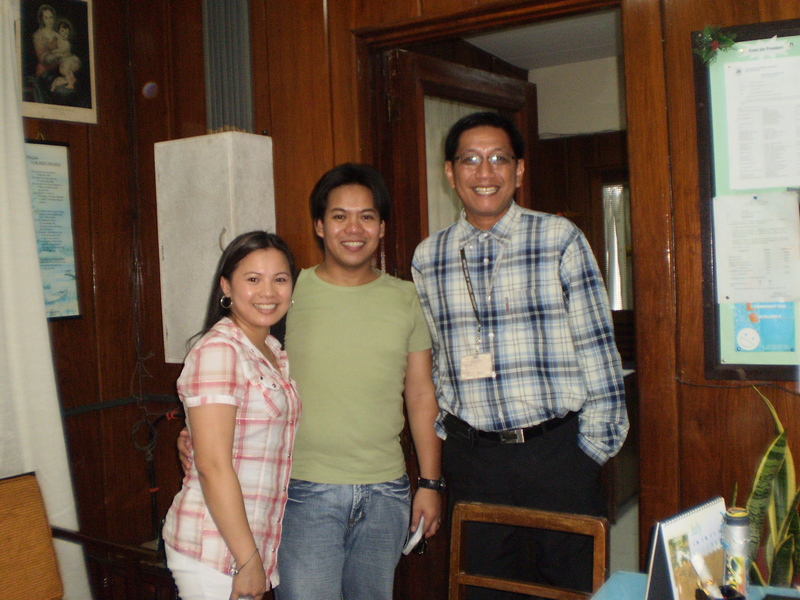 Roming Subaldo (NDMC 85), and Fr. Alex Salas (NDMC 87) came with our official banner and T-shirts. 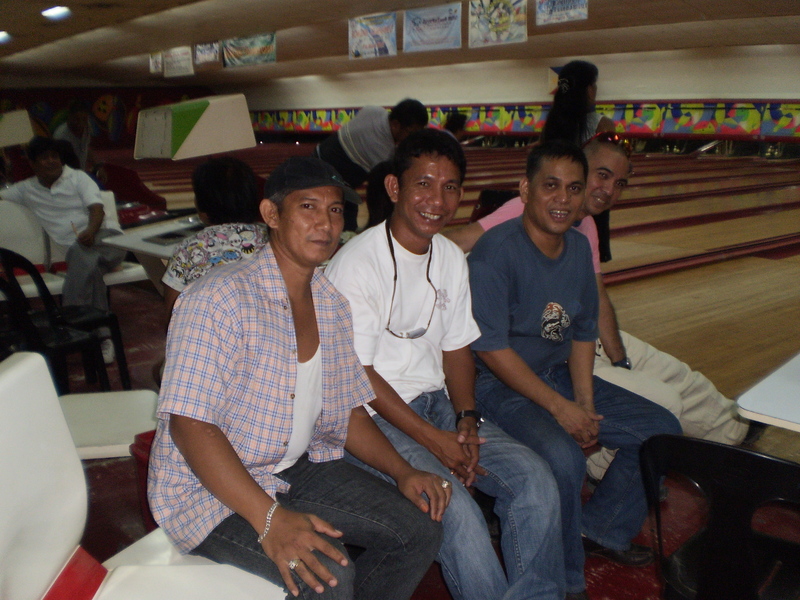 A happy Jerry Llaban (NDMC 89) joined them. Bro. Paul Meuten, Assistant Provincial Treasurer of the Marist Brothers, and Bro. 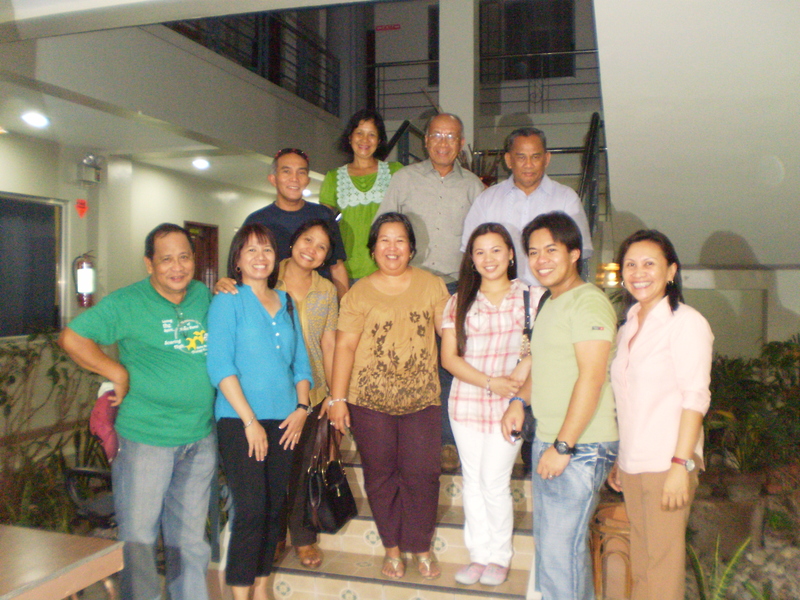 Willy Lubrico, NDMU President, with Edith Plecis (HS 60) caught up with the rest of us. My sister, Anne Morales-Reinoso (HS 74, Houston, TX) and husband, Manny, with children, Daniel and Gabriel, were seen chatting with batchmate Willie Acosta, wife Veda, and his charming mother- Mrs. Julita Acosta, all from Chicago, IL. Of course, our active alumni officers, Paeng (NDMC 79) and Ellen (NDMC 78) Fernandez from New Haven, CT were there to lend a hand as always. Nang Nilda Infante-Lozada ( HS 57) came all the way from Marbel. Grace Camiring-Bernardo (HS 78) from Jersey City and her husband were happy to join us even if according to her, she did not know anyone. That’s the spirit, Grace. She did find friends before the evening was over. It was a happy sight to see everyone interacting. We registered everyone and distributed souvenir bags and T-shirts. Sorry, we ran out of extra large size. “Nagdako ka?…. American size na abi,e” Everybody looked happy. It was a good start – seeing old familiar faces now matured and older, former schoolmates exchanging pleasantries and reminiscing about their Notre Dame days, meeting new friends and long lost relatives, and cameras flashing all around to record the moment. I knew the next two days would even be better. We parted a little after 8:00 p.m. The night was still young and groups went their separate ways to enjoy the rest of the evening. My hubby and I had a nice dinner with Bro. Paul, Edith Plecis, Alice, and Nang Nilda at Caesars Kwi Restaurant. Some tried their luck in the casinos. May nagdaog ba? Saturday- July 16, before 9:00 a.m., Alice, Tino, and I went to the Community Center by the beach at Ventnor, NJ to prepare for the Alumni Luncheon. First alumni to arrive were the Yap siblings who helped us set-up. Gladys and husband, Jr., came with donuts and coffee. 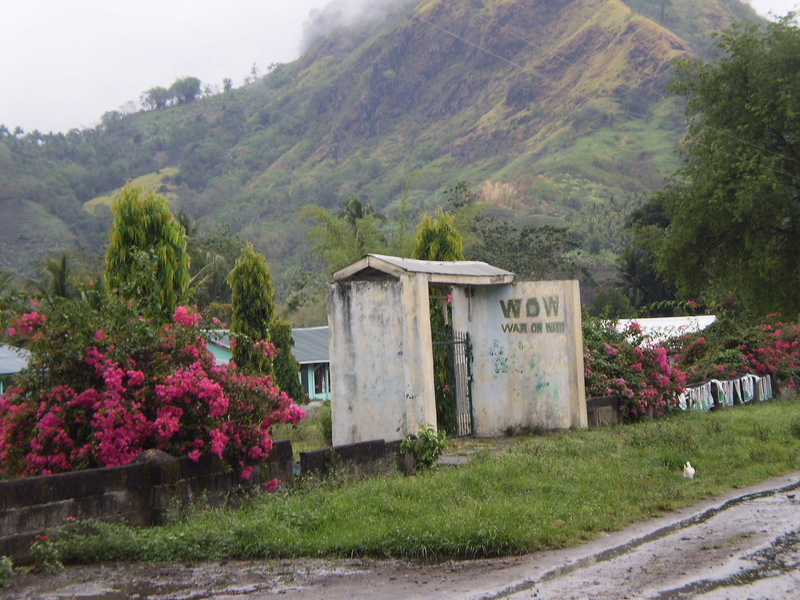 Thank God for cellphones- it was easy to give directions to those could not find the place……kung mabati-an ko mag ring. By half past ten, the hall was bustling with noise from the same group as last night’s. “Late na kami natulog….. Napuyat kami…..Nagdaog ka?…. Wala a. Nag-deposit lang sa casino…. 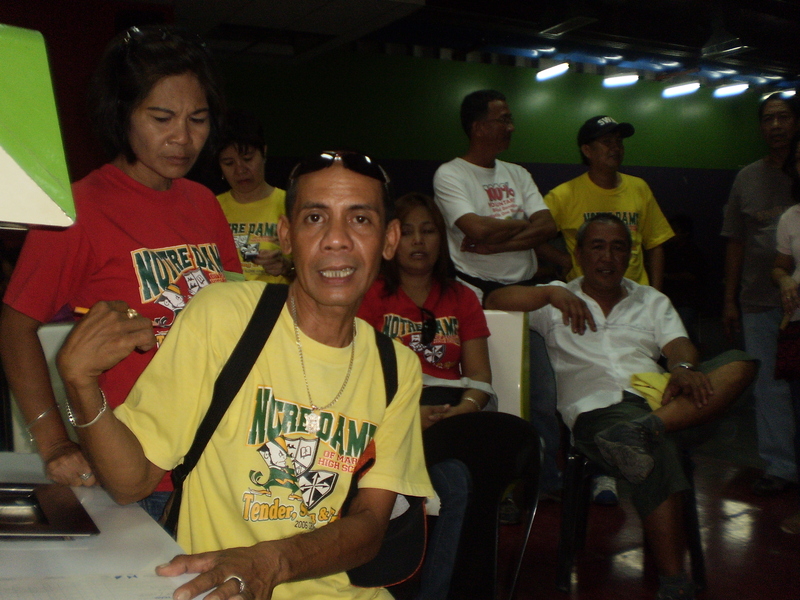 Hoy bayad anay kamo sa registration bago maubos ang kuarta niyo.” We proudly wore our alumni reunion T-shirts. Once again, cameras abound and spouses like paparazzis were busy taking group pictures. ” Hoy upod ako sa picture.” Newcomer Dr. Joesan Gabaldon arrived from New Milford, NJ and mingled easily with the crowd. So did my niece, Kristine Morales-Starks (NDMU 95) and her husband, Greg, from Lebanon, PA; Jerry Sandig (HS 76) and wife Joy; Malou Trespeces-Garcia (HS 72) and hubby from Jersey City, NJ. 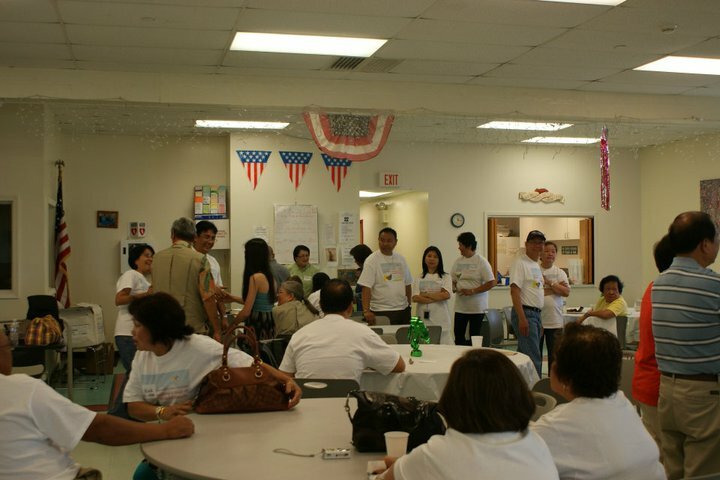 At past eleven, trays of food were brought in by the Soriano sisters and their spouses (Jr., Dong, and Raffy). We had our lunch catered by a local Filipino restaurant. Pancit Bihon, Pancit Canton,lumpiang shanghai, sweet and sour tilapia, Bicol express ( sarap ng sauce),pepper steak, apritada, ginataang sitaw at kalabasa (kanamit no’) fried chicken wings, and adobo. For desserts, we had maja blanca, bico, cassava cake, brownies, and pakwan.Fr. Roming said grace. Now, we can eat. Over 80 alumni and their families got together for lunch. We initially ordered for 50 registrants. Fearing that we will run out of food, Gladys and Oca ran out to get some more from a Chinese restaurant. Everyone was fed and more. Better late than never, my sister, Eileen Morales-Pelaez (HS 60, Cherry Hill, NJ) arrived with her husband, Ray, and family members including her first grandchild- Xavi. Her classmates, Edith and Luis, (who she has not seen since high school- 50 years!) were very happy to see her. 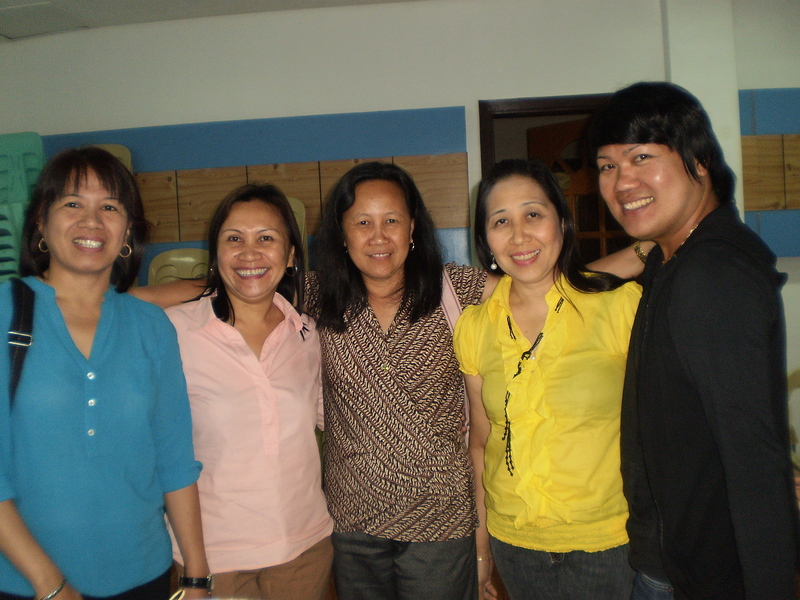 After lunch, we had fellowship games with my sister, Anne Morales-Reinoso, as game master. One of the games was “Sing that Line” with “boys” versus “girls”. I must say they were very impressive. Not only did the contestants sing very well and on note; they knew the lyrics to the songs….well, most of the words anyway. In the tie breaker (yes they were that good), the guys beat the ladies by singing the correct line to “Immaculate Mary”. Hey, ladies, weren’t you members of Sodality of Mary? But wait a minute now……..Fr. Roming Subaldo was in the guys’ group. May expert coach gali sila. Wala abi madre sa grupo sang mga babae. The games were so much fun for both participants and spectators. Ay! kasadya gid. Siyempre, may prizes ang nagdaog. Even the losers got something. 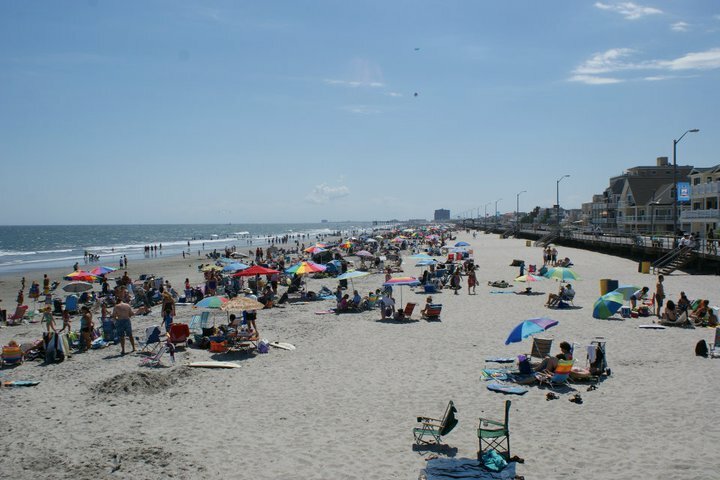 After many group photos in front of our banner, we dispersed at 2:30 p.m. to allow guests to shop at the outlets, make pasyal on the boardwalk, watch the sunbathers and swimmers on the beach by the Atlantic Ocean, or try their luck again at the casinos. After some accounting and working on our checklist for dinner, Alice (my expert accountant turned R.N.) and I opted to take a restful nap. 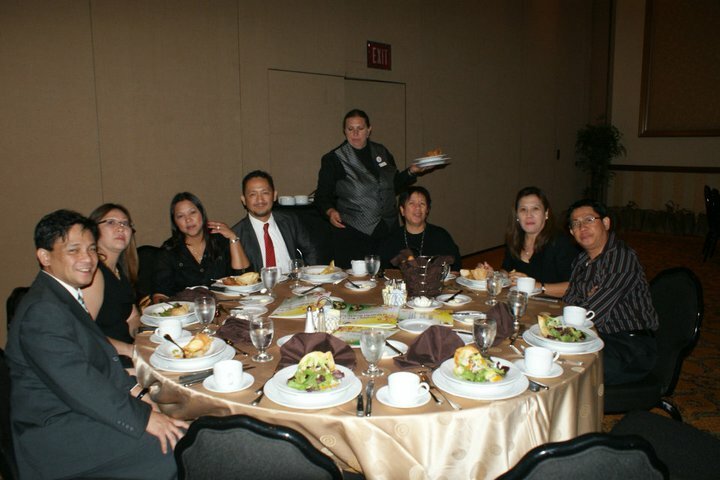 Before 7:00 p.m., we headed to Ballys Traymore Ballroom for our fellowship dinner. The hall looked elegant with the lovely place settings. A few alumni were already there. I finally met Wilson Reyes (HS 55, Chicago IL) in person. He is a regular writer to our Yahoo group and a good friend of my parents. He brought with him his wife, Connie, and son, Chris. More guests came with their spouses and family members. The Del Rosario family from California- 6 in all which included Cesar Sr. (HS 73), Mena (HS 74), Cesar Jr. (HS 97)- made it to Atlantic City after some delay in their trip. Eileen Espanol (HS 77, Houston, TX) came with her cowboy boots on. 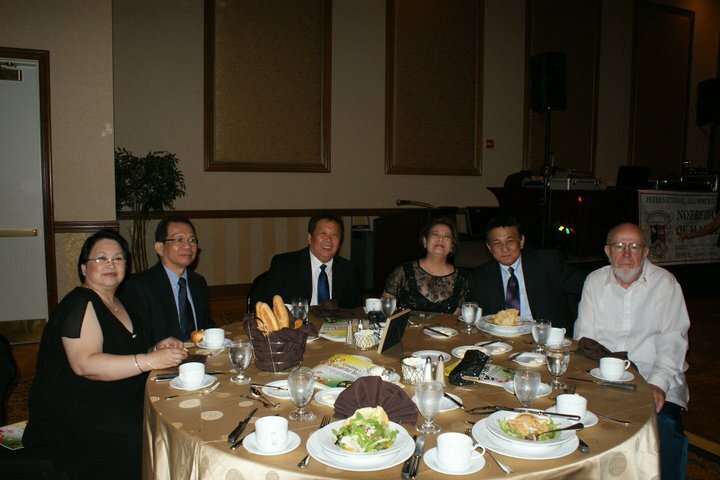 The young Gabaldons showed up- Jesse II (HS 88) and Randy (HS 85) with their dates, as well as Jerry Corpus (86). Chit Calingasan-Teodoro (HS 60, Stafford, TX) drove all the way from Canada with her mother. A lively group of 8 guests from ND Lagao and ND Dadiangas from all over the US joined us in our celebration. 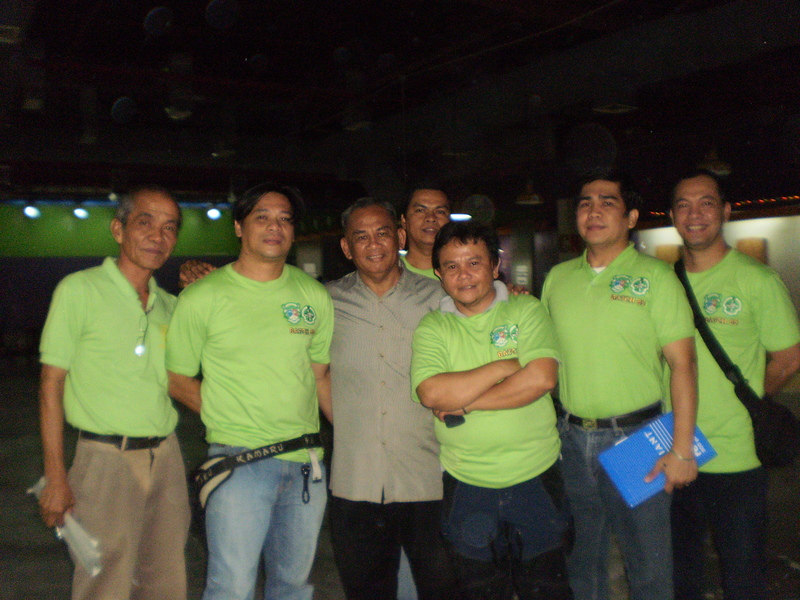 Romulo Roda (NDMC 70) was not to miss this reunion and came straight from Brooklyn, NY after a hard day’s work. So the table was set, the dance floor was polished and the banquet was ready. What’s left to do- get down and have fun! We started with an invocation by Fr. Alex Salas, followed by a welcome address by Pres. Don Donaire. Our first course of the evening was mixed baby greens with mandarin oranges and pecans topped by balsamic vinaigrette dressing and crumbled blue cheese in crepe. Everyone liked the dressing and said so. Our entree was a combination of grilled filet mignon, chicken breast, and shrimp with baked potato, sour cream and asparagus. The meat was tender, with each bite almost melting in my mouth. Heavenly! Then the dessert- Oooooo……a plate of chocolate sampler of flourless chocolate cake with fresh strawberry, Godiva chocolate quenelle raspberry sauce, chocolate mascarpone cheesecake, and ivory mousse with Contreau in a cup. Yum!!! Thank goodness our DJ played funky music in between courses so we could dance away those calories. Music was great and everyone hit the dance floor. Even the men joined the women in line dancing. You should have seen Bro. Willy dancing the boogie. ( I think Edith caught it on video. Check it on FB ) Our emcees, Anne Reinoso and Paeng Fernandez, hosted a lively program. Bro. Willy gave an informative talk about NDMU, its status and projects being undertaken. Bro. Paul gave a short message replete with jokes which kept the audience laughing. Way to go, Orb Luap! Drs. Louis and Josie Reyes presented a special number of Tango. 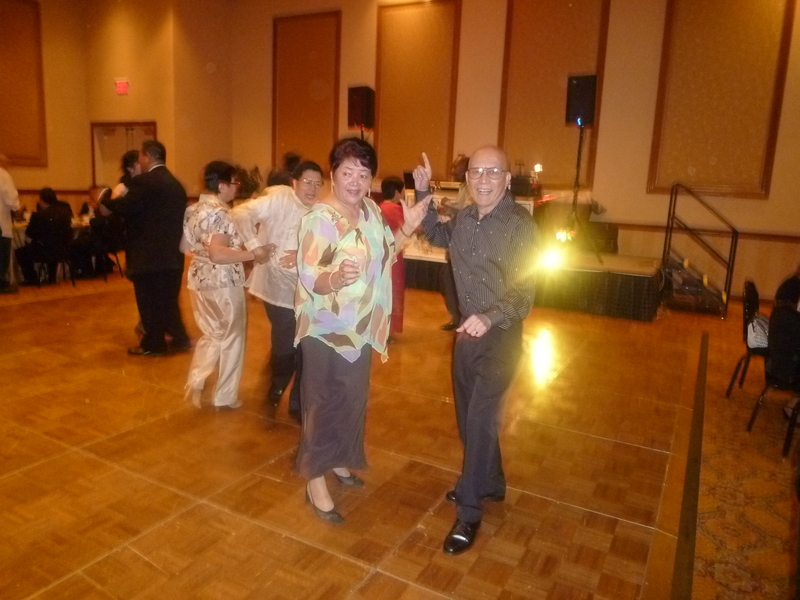 Their graceful and artistic performance in ballroom dancing entertained a delighted audience wanting for more. We had a game of trivia to test the memory and knowledge of alumni in the history of NDM. And guess who won? Table occupied by graduates of the 1950’s! They got 9 out of 10 correct answers. That goes to show their brain cells are still intact and wala pa Alzheimers. Congratulations!!! Youngest Alumnus- HS 1997- Cesar Del Rosario, Jr. It was a great evening to remember. 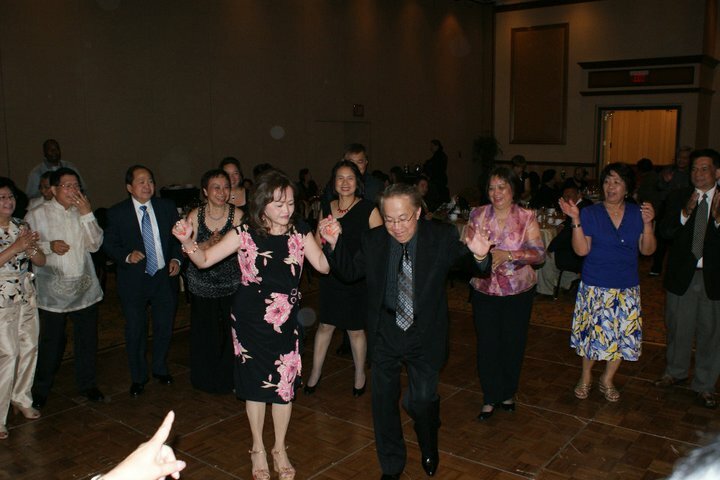 Everyone enjoyed a good dinner, and they had a good time dancing for hours. Kapoy pero sadya kaayo. Of course, more photo ops. We danced until the last song was played and we called it a night at a little past midnight. Well actually, Alice and I stayed up till 2:00 a.m. doing more accounting. Sorry, Alice, may pagka-slave driver ang amiga mo. 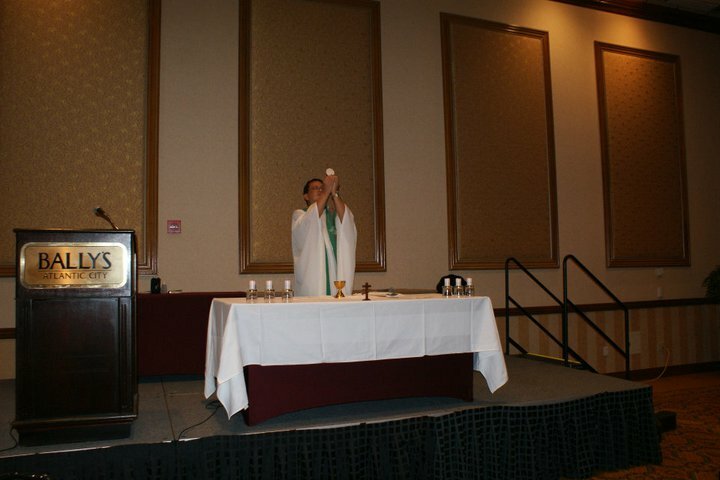 Sunday, July 17- Once again, we gathered at the Traymore Ballroom, this time for Sunday mass at 9:00 a.m. We were fortunate to have 2 alumni priests with us so we were able to arrange to have mass celebrated at Ballys. Fr. Roming was our main celebrant with Fr. Alex assisting. We rehearsed our mass songs the day before at the picnic so everyone joined us in singing. 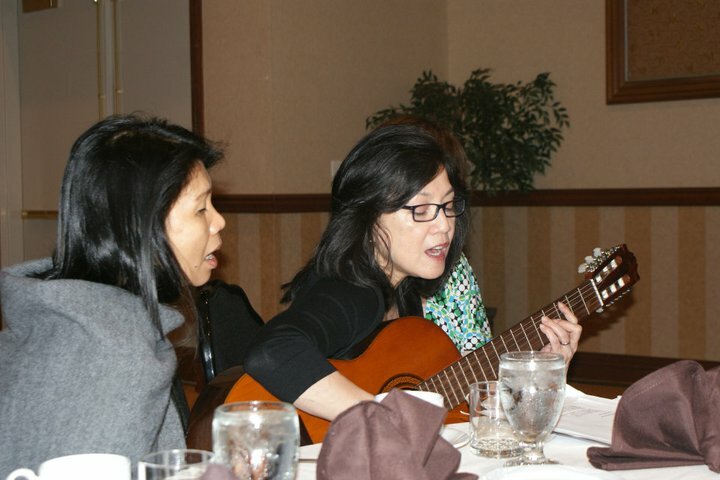 Despite lack of practice, I strummed my old guitar to accompany the lead singers- Emy Sandig, Ellen Fernandez, Fr. Alex, Don, Eva, and Tino. Kabalo pa man gali mag gitara. granola and cereals, assorted juices, coffee and tea. Busog na naman. 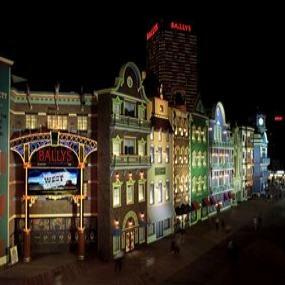 We also voted on the venue for our 3rd International reunion in 2013. Chicago, IL won hands down despite Dr. Lamorena (a Chicagoan) trying to dissuade voters facetiously from choosing Chicago over other suggested places. Well, get ready, Ben. Chicago is our kind of town. After singing Notre Dame Hymn and Notre Dame March with gusto, it was time to say goodbye. It was kind of sad, but a warm and happy ending nevertheless. The newly elected officers had a short meeting thereafter to plan for the next reunion. Strike while the iron is hot, so to speak. Well, we promised a good time in Atlantic City for our 2nd NDMIAA reunion, and everyone had a wonderful time. For all the work and effort we put in to make this 3-day affair a success, it was well worth it. Just seeing the happy faces of those who attended, and hearing all the positive comments were enough to validate a job well done. Your kind words and expressions of satisfaction were quite overwhelming and truly heartwarming. It will be remiss on my part not to acknowledge the people who made this all possible. Oca Bugante- for encouraging alumni attendance to the reunion and helping me navigate along the NJ parkway looking for picnic parks (even if he is from California). Together, we saw many parks I have never been to in all my years in NJ. Toto Yap – for his generosity and services to print our souvenir program for free. You did a beautiful job coordinating with Jing and her IT crew from NDMU who did the layout. 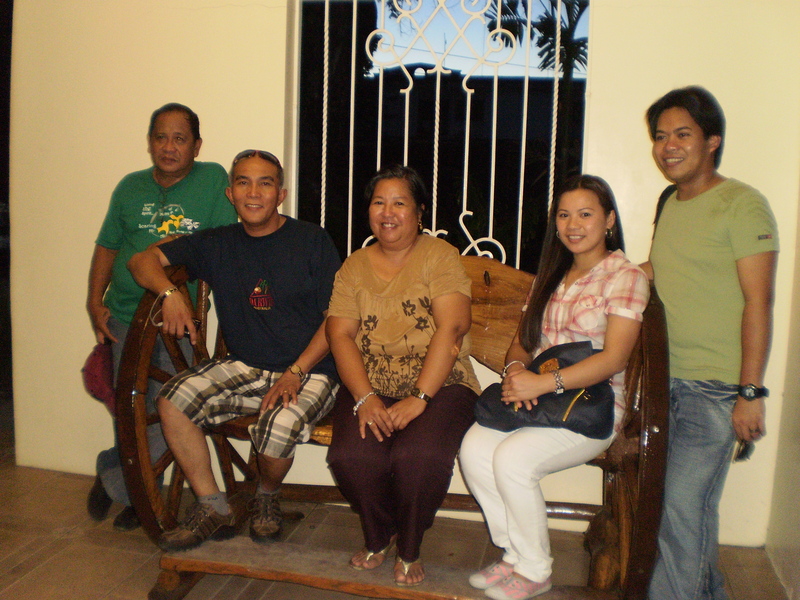 Kuya Dado Non and Edith Plecis- for taking care of the ride, registration, and accommodation of our honorary guests- Bro. Paul and Bro. Willy. Tino Estella- my husband, for his understanding and support of all the reunion preparations I was engaged in. And for simply smiling while everyone spoke in Ilonggo, even to him who mainly speaks Tagalog. And last but not the least- to all those who attended our reunion in Atlantic City. YOU made this event happen. YOU contributed to its success. We prepared a banquet for you and you accepted our invitation. Over 100 guests registered and out of that were 57 alumni. We made sure that you had a great time. And I believe that we delivered. We look forward to seeing you in two years in Chicago and we hope that many more will join us. I know you enjoyed AC and you will have an ever better time in the Windy City, right Willie? You have 2 years to prepare. Spread the word. 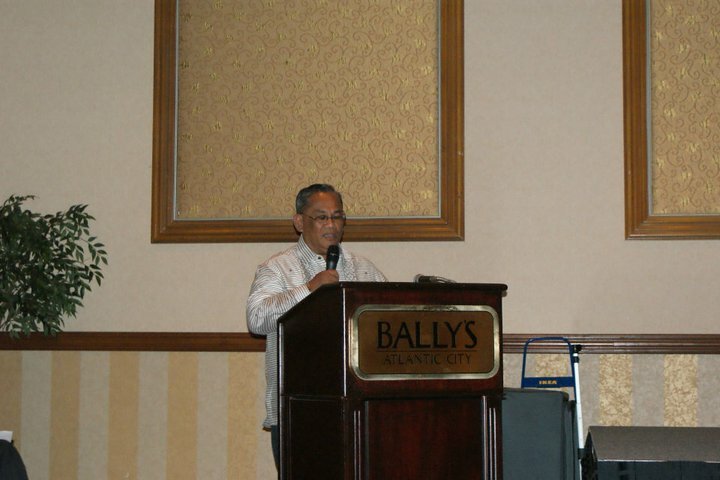 Thank you for the opportunity to host the 2nd NDMIAA Reunion in Atlantic City. It was indeed my honor, privilege, and pleasure to chair the event and provide an occasion where Notre Dameans from Marbel had a chance to rekindle old friendship and reminisce happy memories of their youth and education at Notre Dame of Marbel. For 3 glorious days in AC, we were blessed with beautiful weather and we gave you a piece of Marbel. I hope that you all got home safe and sound; and best of all, keep the happy memories of your visit to the east coast alive and burning in your hearts. 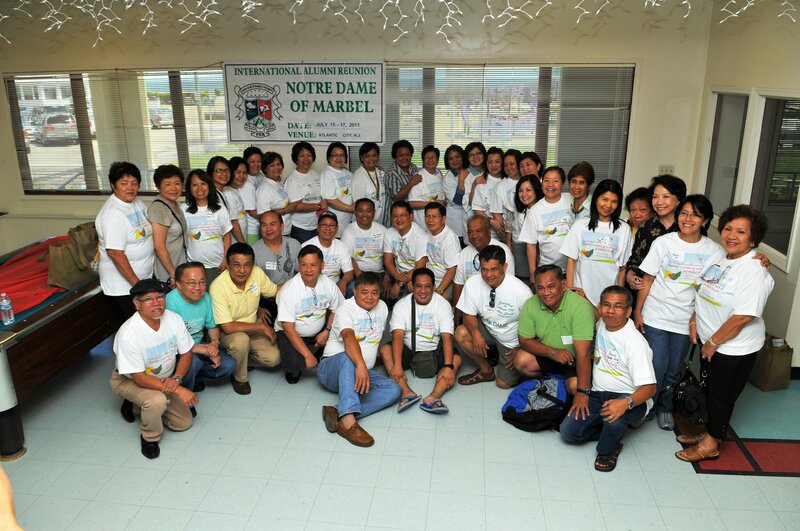 Jing and others have posted many photos and video of our 3 day reunion on Facebook and Shutterfly under Notre Dame of Marbel International Alumni Association. These are happy reminders of a summer to remember in Atlantic City. Let us continue to stand for our Notre Dame and remain loyal and true. And our hearts forever, praise thee Notre Dame. And our hearts forever, love thee Notre Dame. WE ARE THE CHAMPION! 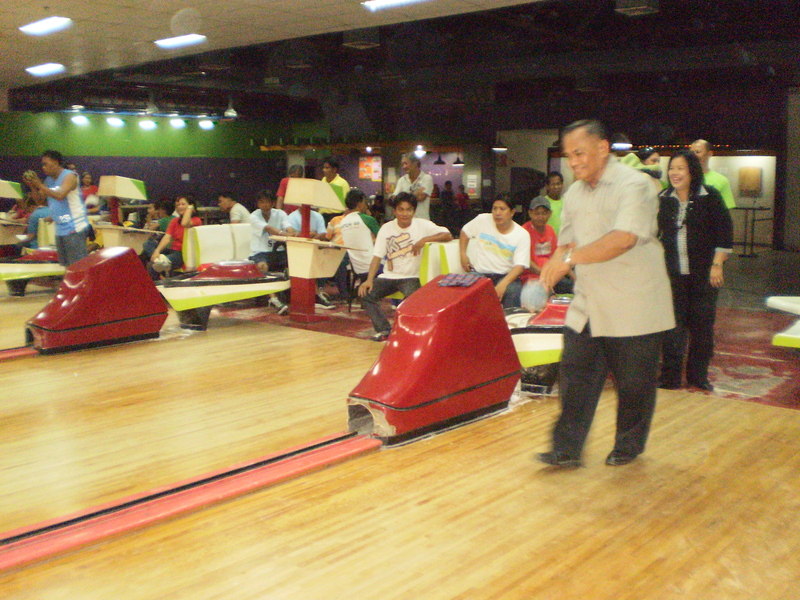 Undauntedly, the HS class 75 threw in the last ball leading to their winning the 2010 NDM Alumni Bowling Tournament last Sept. 4 at the Fitmart Bowling lanes. They claim that it was their team spirit and the support from classmates that made them win. They were also motivated to improve their game with the presence and participation of classmate and now South Cotabato Governor Dodo Pingoy . 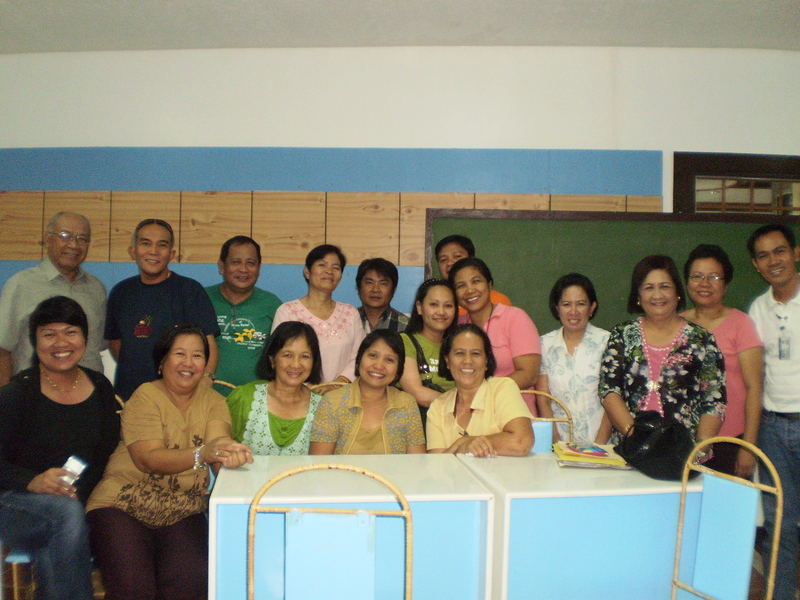 The Alumni Activity this year is only part of the planned activities before the homecoming in December 27, 2010. Three years ago, when the game was scrap from the list of alumni activities, the enthusiasm to play against each other simply melted away. The old bowling alley was gone and the new venue at the mall was not really that inviting. There was no place where Alumni can have a friendly competition , laugh and drink with high school buddies and friends. The bowling Alley has always been a melting pot for the young and the not so young alumni. 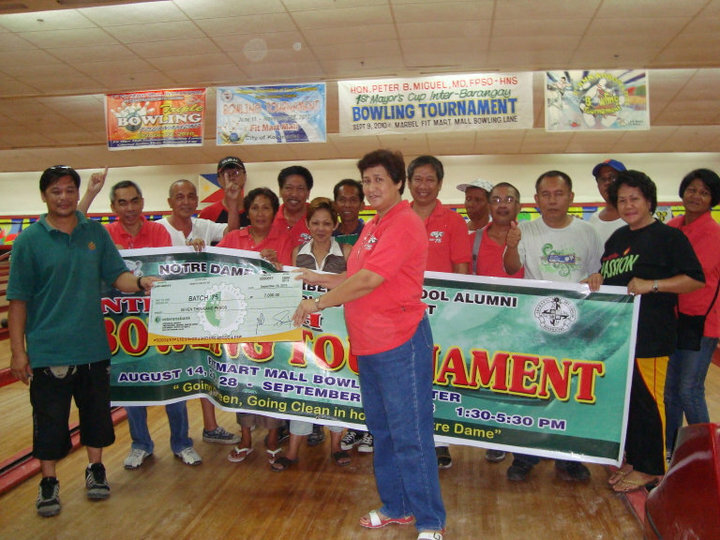 This year, the High School Alumni Association under the leadership HS batch 85 , the host of 2010 Alumni Homecoming have calendared sports events such as bowling, basketball and badminton to bring together Alumni in the spirit of unity, camaraderie and friendship. 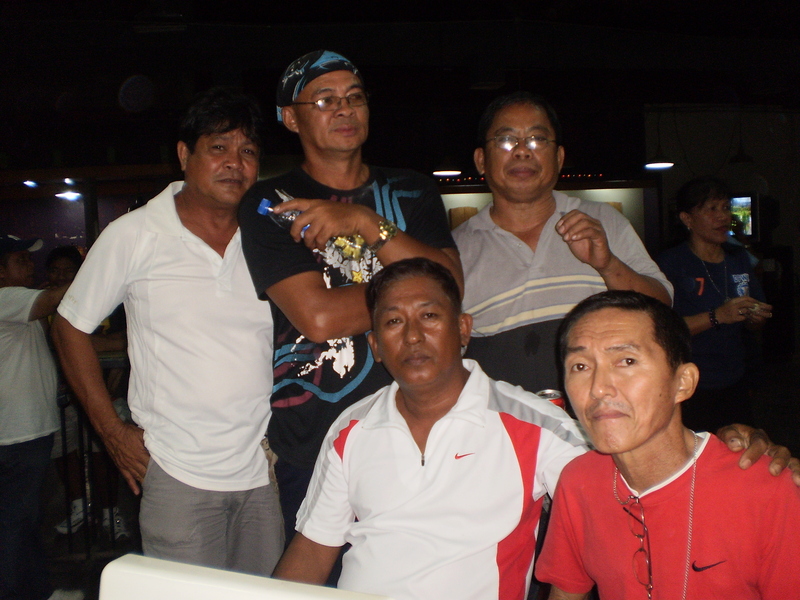 The tournament started last August 14, 2010 with Bro. Willy, NDMU President , Tomasito Montano, NDMU IBED Principal and Merle Padua representing Sienna School leading the ceremonial throw which signals the start of the tournament. The battle cry of every Alumni team is “ Win or lose will hold thy name in honor to Notre Dame”. It was raining very hard that evening and most people were probably in their home sleeping comfortably in their beds or staying late working on their computers or watching television. Everyone thought it was just a simple harmless rain . 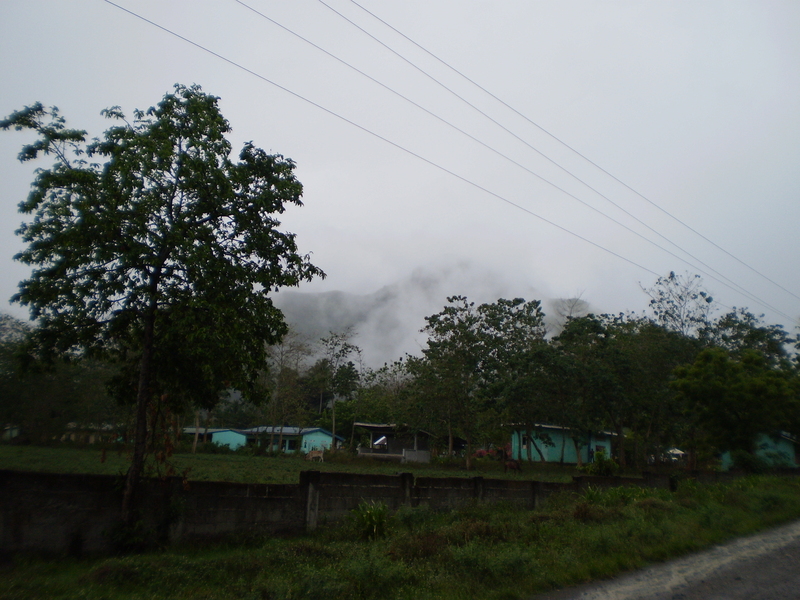 Little did we all know that upper Acub in San Isidro had a landslide and people were crying for help and assistance. The flood water in Carpenter hill was slowly rising and making the road impossible to pass . Motorist were stranded and had to be diverted to Tampakan for them to reach Marbel. I take my hats off to both the Provincial and City Government for a quick response thus averting a more disastrous situation. 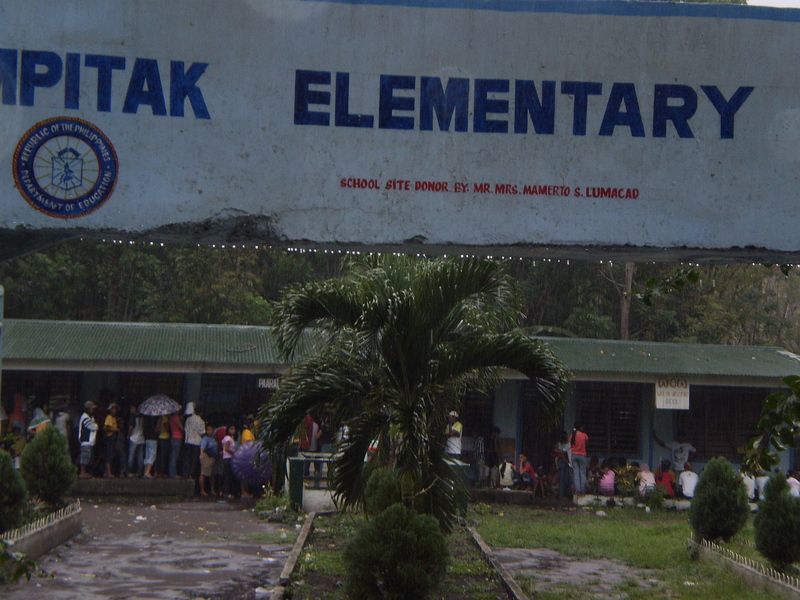 Last Sunday, Sept. 19, 2010, the students (GIA Working Students and LEPS students) , together with Alumni who are at the same time HAKBANG volunteers distributed relief goods to the affected families now number 81 at Bacongco Elementary school. Our heartfelt thanks to Alumni of Batch 74 Sol Mangisel- Schmeckel from Germany who sent us 4 sacks of rice so we can distribute these among 81 affected families. thank you Sol for sharing your resources to the residents of Sito Acub. 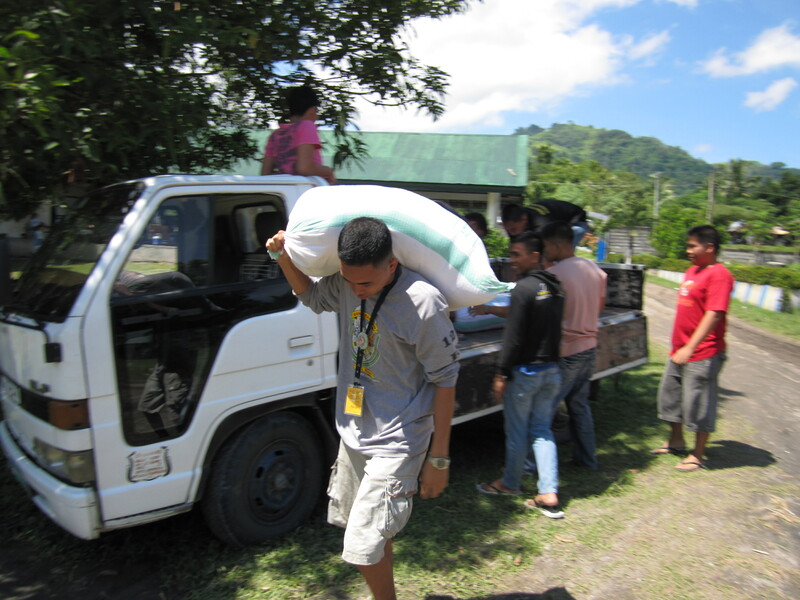 We turned over the relief packs to DSWD workers who were detailed in the elementary school. Susan Garcia-Restauro also of Batch 74 donated cookies which we handed over to the children. Our Batchmates Boy Boldios and Felipe Laguna joined us in the distribution of the relief goods. 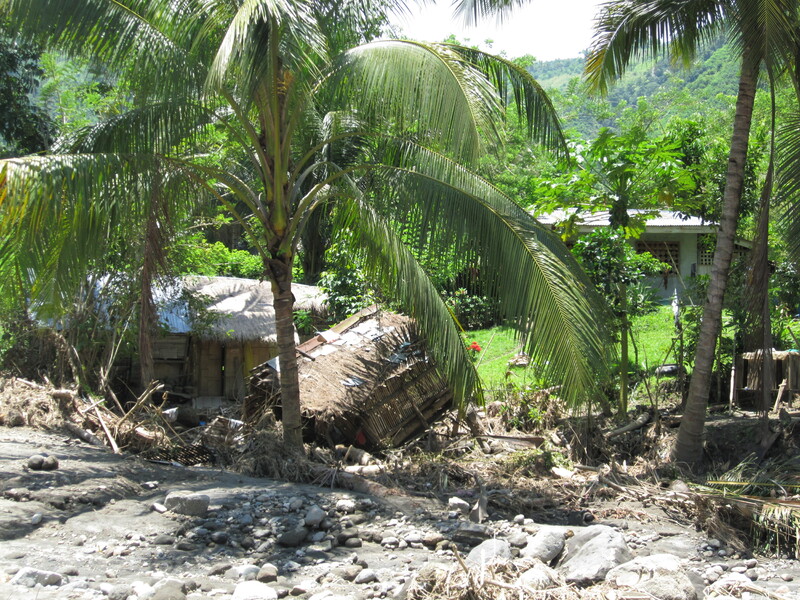 We conducted interview with the Purok officials and some residents where they shared their harrowing experience. One person who was out drinking with his friends could not believed that his home was gone and his wife and 10 month old baby were carried by the flood. they died instantly. They remembered just hearing a rambling sound and a loud thud. they knew something was wrong but could not really see what was happening since upper Acub does not have electricity. 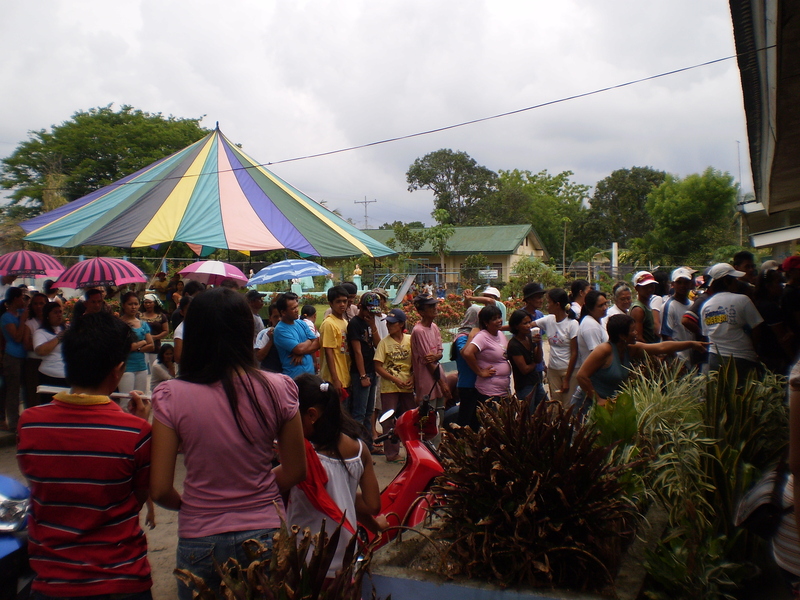 The Alumni accompanied the students to do ocular inspection of the flood site. 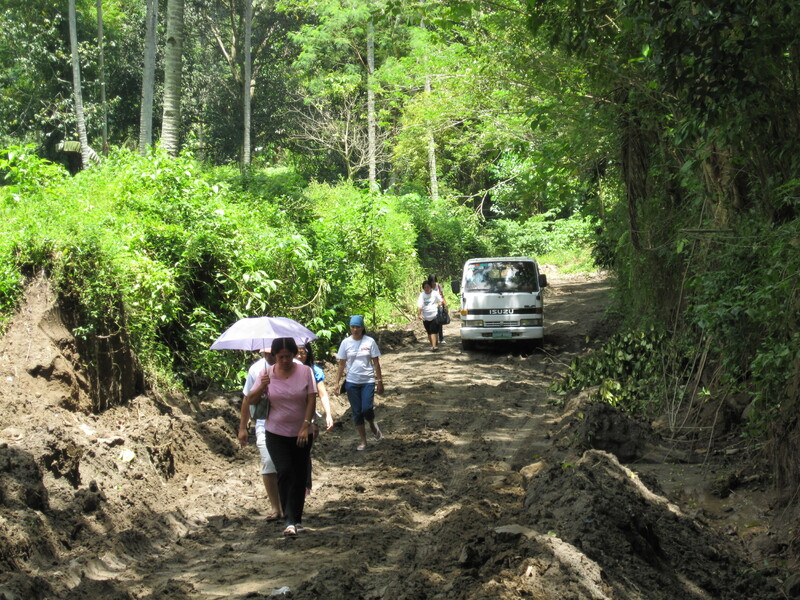 it was a bumpy road up ahead and we were forced to leave our vehicles when we were nearing the landslide area. Alumni Roger Doronio’s truck got stuck in the road and had to be pulled out by a Government vehicle. With nothing else that we could do, It meant , hiking for a few kilometers more. Remia, Jo and myself were just thankful that rain did not come that day or else we would be buried in the mud since we were awfully slow and could hardly catch up with the students. Husband and wife tandem Nonoy and Liza Aliligay, Ralphy Palencia were walking so fast that they were the only adults who can catch up with the younger ones. Alumni Dan Fresco was left behind to help Roger fix his truck . What we saw upon reaching the place really shocked us. We saw how mother nature unleashed its fury. 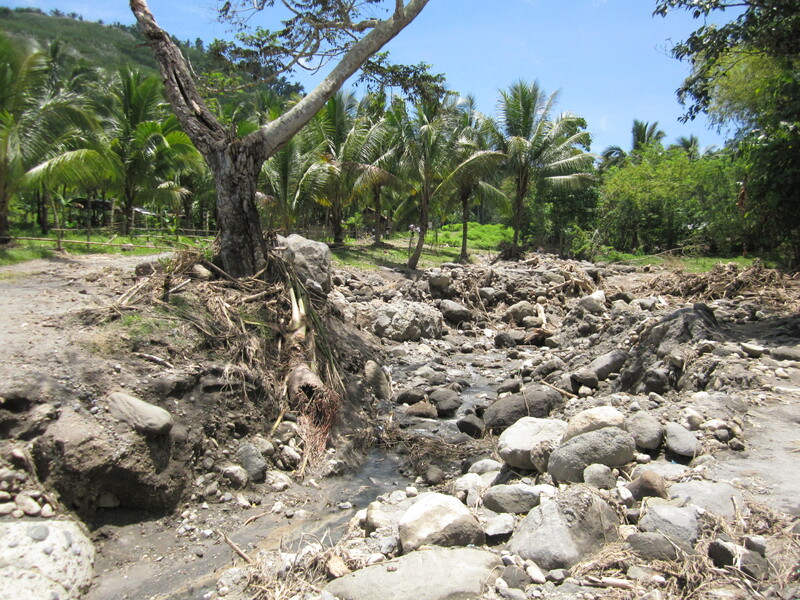 The road suddenly turn into a river bed where rocks and boulders just block off the entire road. The place was quiet , no sound of children that usually greet us whenever we come to visit their place. The school building remains intact and our paint cans are still there. Why did this happen? I can only think that perhaps one reason is the slash and burn(Kaingin) practice of the residents. The source of income for them is to sell uling (charcoal). I really do not know if the trees they cut are even replaced. I hope this experience has taught us a valuable lesson in life that we should take care of God’s creation as this is HIS gift to humanity. The HS Alumni challenge..LETS BOWL! 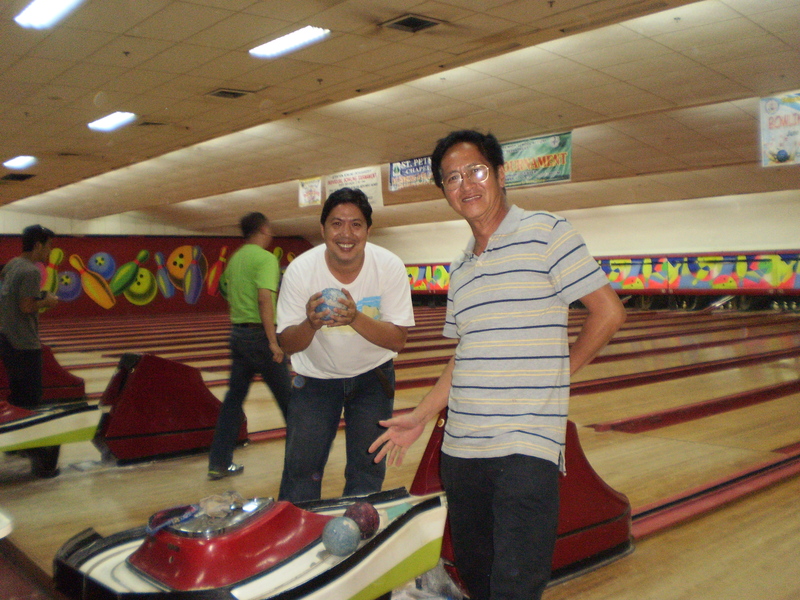 Bowling has always been a favorite game of the alumni during homecoming season. Three years ago when the game was scrap from the list of alumni activities , the enthusiasm to play against each other simply melted away. The old bowling alley was gone and the new venue at the mall was not really that inviting. 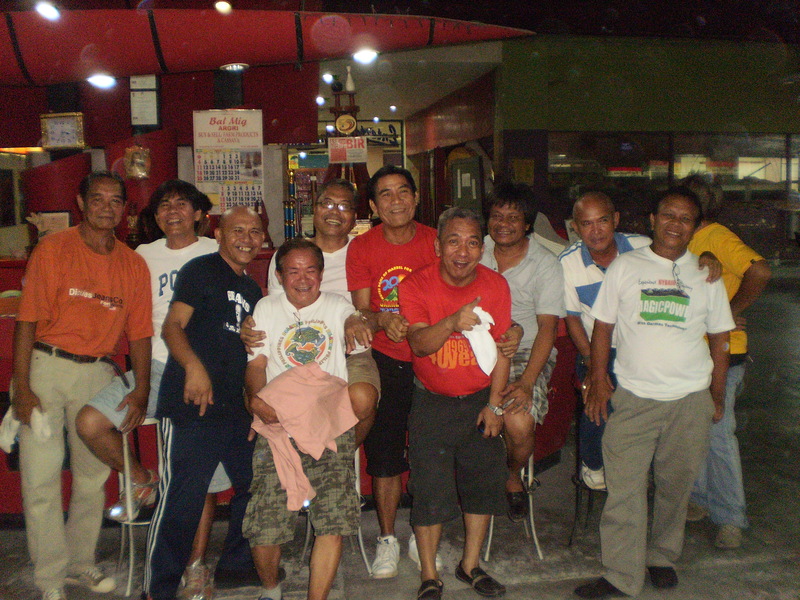 There was no place where Alumni can have a friendly competition , laugh and drink with high school buddies and friends. 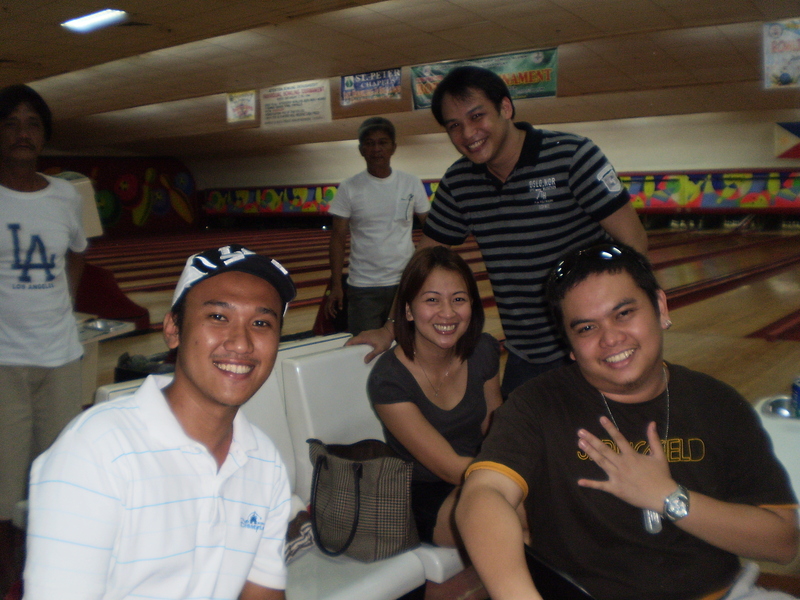 The bowling Alley has always been a melting pot for the young and the not so young alumni. 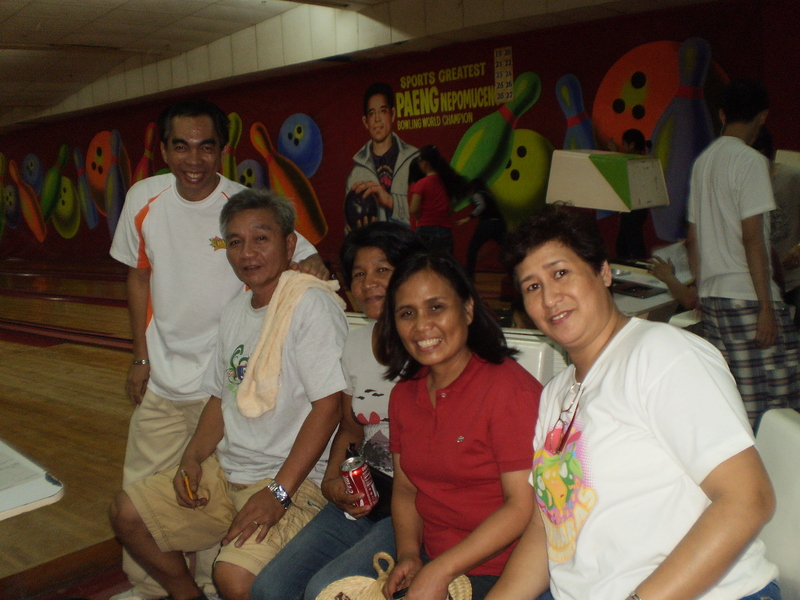 Last August 14, 2010 the Alumni came with their classmates and friends to the opening of the Bowling Tournament. Everyone stood still as the singing of the Notre Dame Hym and together sang with so much passion as the Notre Dame March was played. Cheerfully they tried to remember the lyrics to the song .. HAIL! HAIL! To our Notre Dame, loyal and True will hold thy name. The ceremonial throw was lead by Bro. Wilfredo Lubrico, FMS , University President, Tomasito Montano, NDMU IBED Principal, Merle Padua representing the Sienna School and yours truly as Alumni Coordinator. The games will stretch for four Saturdays starting last August 14 until September 4, 2010. The battle cry will always be “ Win or lose will hold thy name in honor to Notre Dame”. The annual celebration of the Tinalak festival is also the South Cotabato Foundation Anniversary. This is a week long celebration that starts on the third week of July and culminates on the 18th of the month. As expected South Cotabatenos from here and abroad comes home to join the celebration. 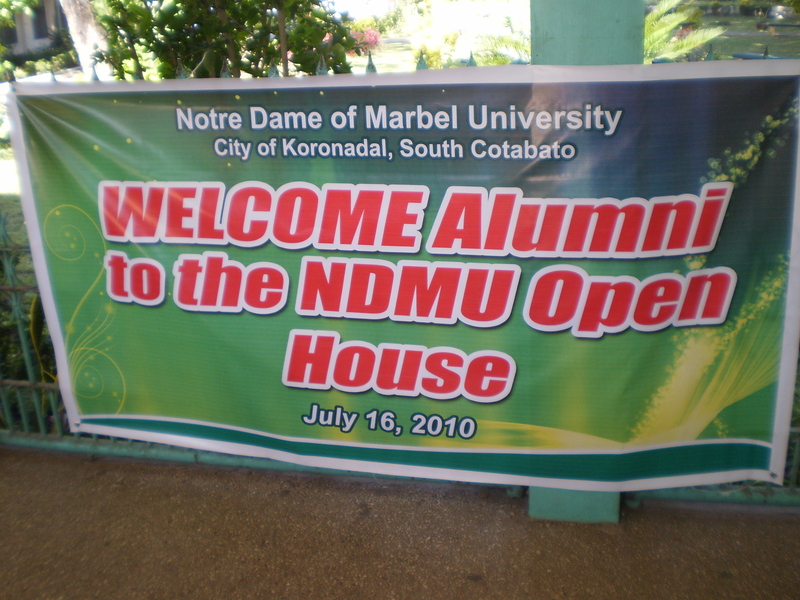 NDMU on the other hand , takes part by welcoming visiting alumni to the University. The Open House is a yearly tradition where alumni are invited to visit the university, share their experiences, meet friends, teachers, and enjoy a campus tour. This year the activity was held last July 16, 2010 3:00 p.m. Alumni Center. The visiting alumni came from other parts of the country and some from US, Dubai, China, New Zealand, Australia and Japan. Listening to the alumni as they share their stories gave us a glimpse of their long hard climb to reach for their dreams. It was not a bed of roses but for them it was all worth it. Engr. Marjo , a BS Che graduate recalled how he had to deal with certain biases when he took the Board Exams for Chemical Engineering. His experience did not stop him from pursuing his dreams. Wih sheer determination and perseverance he even topped the pre Board exams which eventually earn the respect of his peers and teachers. 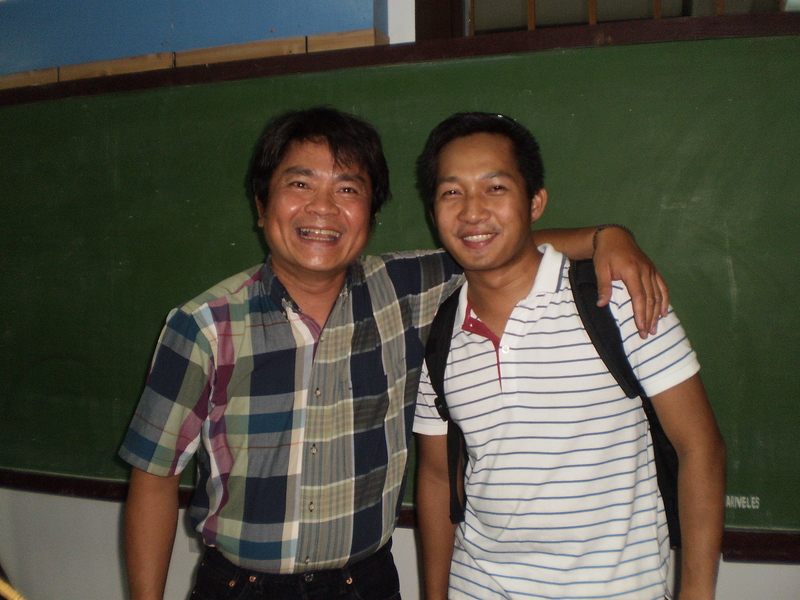 Mr. Berin, a high school batch 63 alumni talked about his high school teacher, Mr. Solivio. He was for him the best Art teacher. He remembered the time he assisted Sir Solivio in painting the Last Supper and St. Marcellin Champagnat ‘s picture. With fondness, Rudy said his teacher was a real good painter and wishes to see his artwork displayed in the university. Benjamin Rimando, high school batch 72 alumni who is now based in Australia as Safety Personnel agrees that poverty is never a hindrance for success. He said his mother was a laundry woman of the Marist Brothers and his father was a driver. Yet despite this he continued to make a mark for himself proving that he can pursue his dreams no matter how poor they were. Nimfa De Lira a SPED teacher based in Chicago shared that Filipinos are known for their hard work and dedication to service. In the US her immediate Supervisor was amased how this little Filpina can extend long hours just to help co teachers with their task . The stories , sad or happy ones were endless but it gave everyone an opprotunity to learn from each their past as well as their present undertakings. Everyone agreed that the education they got from NDMU contributed to their success. They are proud to be Notre Dameans! Bro. Willy , the University President congratulated the Alumni for making it this far in their careers. He was glad that they came to visit and see the changes that took place after they left the portals of notre Dame. He shared that the development at NDMU is geared to giving the best education to its students. The fellowship ended with a campus tour where alumni were awed at the transformation of the university. Strolling down the corridors meant walking down the memory lane and remembering the best part of their student days. For the alumni it was good to be home and for the university it was good to see them back. Let me share my experience on the 2010 election. Funny how i use to tell everyone that I have always been apolitical. Being an election watchdog was never my cup of tea much more campaign for someone else. Well, my online friends have heckled me to join a group to support a particular presidential candidate whom others says is our hope for change. However, i always have reasons to refuse. I guess all I wanted to see is that the Philippines move out of its labyrinth of patronage politics. Until now you can see how Politicians has mastered the art of persuasion. Well in fairness we have good ones whose heart is to really served the country but there are those bad eggs that you can really smell from the distance. This year though is the Philippines first automated election and to be part of it means so much more. The change of heart comes from the fact that automated election is going to be tried on the 2010 election. Its success would mean moving forward to a better Philippines and failure would mean going back to the dark age of manual counting , of dag dag bawas. Responding to the challenges of the times, NDMU being part of Catholic Educational Association of the Philippines (CEAP) has accepted to be part of the Parish Pastoral Council for Responsible Voting (PPCRV). The coverage area for the University were the following: Koronadal, Tupi, Tampakan, Surallah, Lake Sebu, Tantangan,Norala, Banga anf T’boli. PPCRV is the only election watchdog accredited by the COMELEC to get a copy of the election return. NDMU personnel and students volunteered to be part of this huge undertaking. Weird but i have this strange feeling of excitement and wanting to do more for my country. I guess everyone who volunteered that day have the same feelings as well. 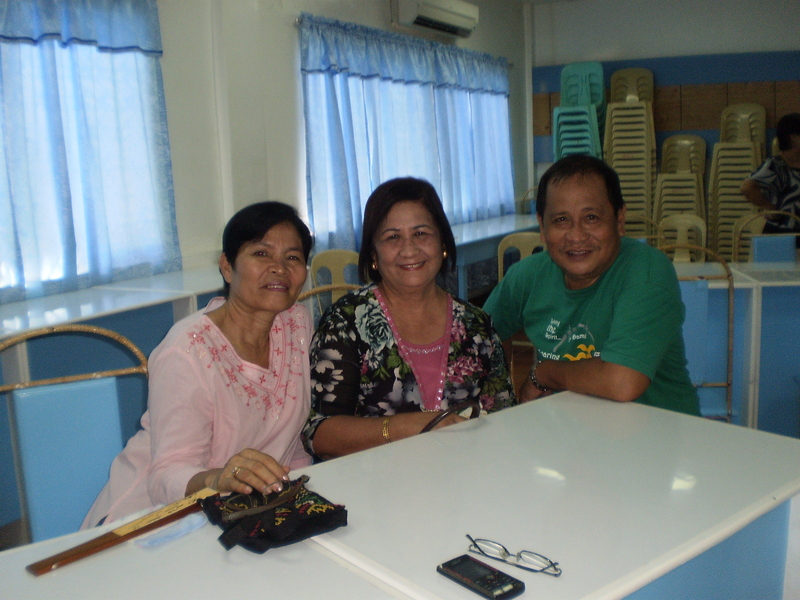 My husband and I were both assigned as Municipal Coordinator for PPCRV in Tampakan, my husbands hometown. Two days before election were were rounding up volunteers who wanted to take part even if it means getting a very small allowance for food. 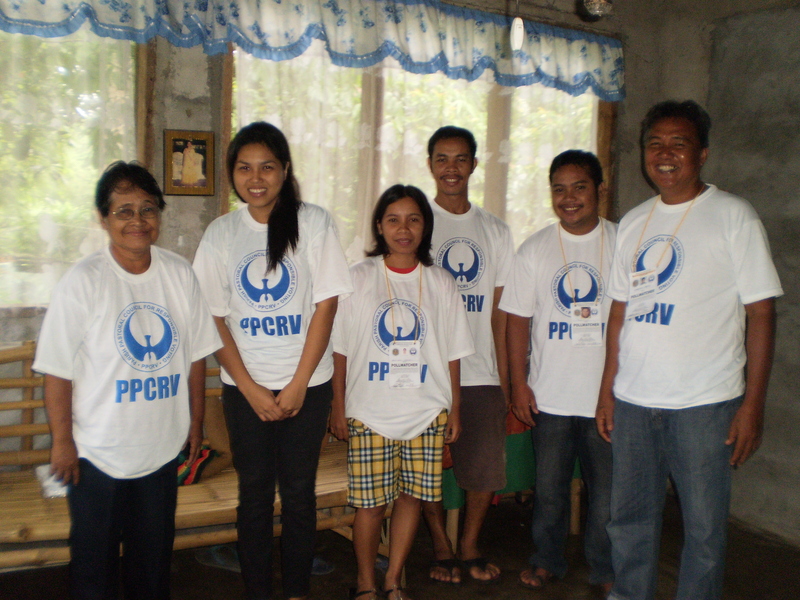 We gave them their Tshirts and PPCRV IDs and everyone was eager and excited to get started. We were monitoring the polling places from the town of Tampakan to the barrio of Maltana and Kipalbig then up to the mountain part part of Lampitak, Liberty, Lambayong and San Isidro. 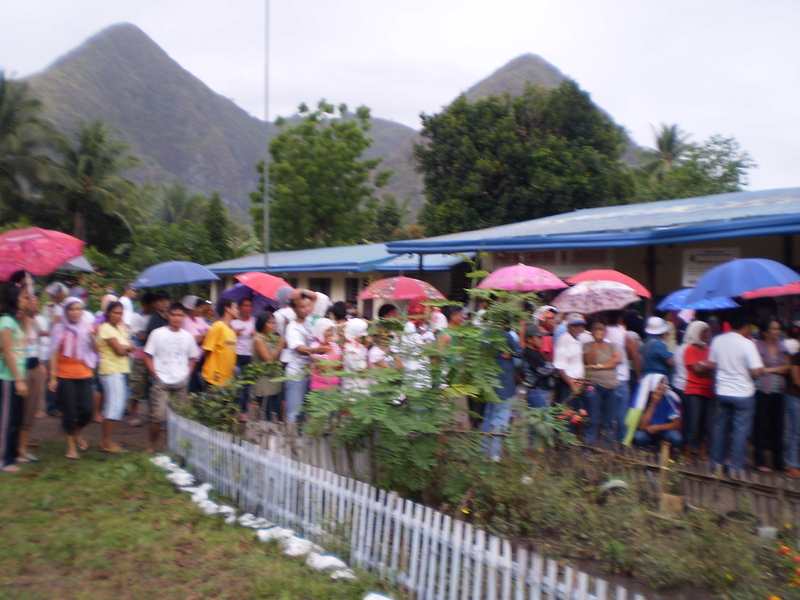 It was raining very hard yet you could see people lining up to cast their votes. Some PICOS machines were not working and had to wait for the technician to fix the problem. Despite this the people stood outside and waited until 9 in the evening. The long line was due to the clustered precinct. We were teasing some people we knew “hoy puli na kay gab-i na hindi na kamo makaboto”..(go home its getting late you can no longer vote) we were surprise to hear them say..”dugay kami hulat sa pila hindi gid kami mapuli sayang ang boto namon.” (We have waited in the line and we will not go home. We will not waste our votes). When votes were ready to be transmitted all poll watchers stood and watch. In all honestly my heart was beating so fast and i was trying to control my tears when i saw how fast the votes were transmitted. For the first time no teachers were manually counting the votes! Never before… Some people think that the automation can be rigged ..maybe so. But i dare them say that the manual counting is much better and can not be rigged at all. What a shame really! For all its worth my spending the whole day at the various poll sites gave me more reason to be proud of what everyone has accomplished on election day. It will be remembered and i can say with conviction that i was part of the history of Philippines automated election. God Bless us all.